Activities During Boarding School I played varsity volleyball, basketball and lacrosse, and went on to play four years of varsity lacrosse in college. On another note...during my senior year at Loomis, my Shakespeare teacher (who also heads the theatre program) encouraged me to write and perform my own autobiographical one-person show. Thank goodness, too! If Mr. Kosanovich hadn't identified my propensity for the theatre during that very last semester, I never would have ended up where I am now -- earning my MFA in acting at the Brown University/Trinity Rep Consortium. I'm going to Broadway, baby! 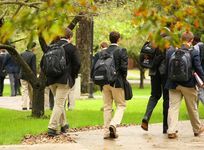 Loomis excels at surrounding each student with an extensive network of adults who are all interested and invested in that particular student's life and development. As a boarding student, I had a dormhead and two other live-in dorm faculty who were around all the time. We also had a different faculty member "on duty" each weekday night for study hall, which added five more adults into my immediate circle of influence. Furthermore, I had several academic teachers in any given term, as well as my coach and assistant coach each season. Each of these faculty members interacted with me in a different venue and therefore influenced different aspects of my development in his or her unique way. I wasn't aware of it at the time, but virtually every moment of my Loomis Chaffee experience was guided by one adult or another who subtly encouraged me, always, to be my "best self". Also, on another note, the campus is simply gorgeous. I can't imagine many other students enjoy such idyllic surroundings. As I worked through undergrad and now continue through graduate school, I have realized more and more how formative my years at Loomis were. I still carry many academic lessons with me -- the strength of my writing, for example, or my ability to speak conversational Spanish. More importantly, though, I realize that Loomis really did inspire in me a "dedication to the best self and the common good". Here is one small, but telling, example: my dorm head for two years ALWAYS picked up litter if she saw it on the campus. It was a small lesson, but she wanted us to take pride in and responsibility for our surroundings. Now, as I walk to my graduate classes here in Providence, I find myself reaching down to pick up an errant wrapper or styrofoam cup, specifically because of this one woman's influence. I wouldn't change a thing. My Loomis experience was exceptional, and I look back with complete fondness. I know that makes it sound like I drank the Kool-Aid, but I didn't! It's all true. I simply had a great time. For kids going to boarding school, make sure that you are open minded to meeting all different kinds of people. If you reach out, your experience will be much richer. Also, make sure you have a good sense of self discipline. There will be plenty of people around to encourage you and help you develop good work habits, but ultimately your success will depend on your own efforts. I liked the spirit of the school the best. We were intellectually curious, but not elitist. We were competitive, but had great sportsmanship. We were encouraged to excel, but were always taught that excellence of character was more important than simply making good grades. We came together on one campus, but were drawn from hundreds of different backgrounds. We were pushed to be our best selves, but were given the freedom to be our unique selves. If you go in the fall or the Spring, ask to see the fields behind the hockey rink. They are a gorgeous and well kept secret. No matter what, ask to look out over the Meadows. You will be reminded of how small you are, and how big the Universe is. Also, if there's only one building you can walk through, choose Founders Hall. It has great character. The English curriculum at Loomis Chaffee is TOP notch. In addition to developing critical reading and analytical skills, our English teachers focused intensely on developing our facility with writing. The rigorous standards they held me to did more than enough to prepare me for the academic challenges I faced in college. In fact, between you and me, there were some mediocre papers I handed in at Amherst that I never would have DREAMED of handing in to my AP English teacher at Loomis! I loved playing sports at Loomis. My coaches always encouraged me to work my hardest, but also emphasized that teamwork, leadership and sportsmanship were much more important than competition. That being said, we certainly enjoyed winning! One of my favorite memories of Loomis was leading the lacrosse team to an undefeated season my senior year. Please scroll up to the "Activities" section to read my comments on the theatre program. I will use this space to comment on my participation in two semesters of photography class. Mr. Rabetz took great care to teach us all the demanding techniques of developing photographs the "old fashioned" way (i.e. on film, in a darkroom, etc. No computers!). Looking back, I am blown away by the quality of the facilities we had the privilege of working in. Furthermore, I realize that Mr. Rabetz first inspired in me a sense of passion and respect for creative work. I am no great photographer, that is for sure, but as I pursue my artistic career in the theatre I carry with me this sense that what I choose to focus on and create should demand my utmost attention, care and respect. My main extracurricular activity was serving as a Prefect and Resident Assistant in the dorm communities. As a Prefect, I was a junior living in a dorm with freshmen and sophomores. The five other prefects and I helped enforce some of the dorm rules (which I was never very good at). We also served as role models for the younger students, as well as a kind of liaison between them and the dorm faculty. As a senior I was a Resident Assistant, which is sort of like a Prefect except I lived with other upperclassmen. I was less of a role model in this position. However, I was the Head RA which meant I participated in dorm life discussions with all of the dorm heads of the whole school, and therefore got to influence decisions that directly affected the lives of my fellow boarding students and myself. This was the best part of Loomis! I lived close enough to school that I could have been a day student with a little bit of a trek, but instead I decided to board. It was the best decision ever! My two best friends to this day were fellow boarding students, and I am still in frequent communication with one of my dorm heads/advisors who was an invaluable influence during my three years. Obviously, living with all of ones friends is great fun. In terms of more specific stuff... the dorms are split up so that freshmen and sophomores live together in dorms off the quad, and juniors and seniors live together in dorms on the quad. I think this system works well, especially b/c there are a handful of junior Prefects who live in the underclass dorms so the age groups aren't entirely segregated. When I was a sophomore, I liked living with my peers while having a couple of older to students to whom I could look up. The dining facility was comprised of two large halls, separated in the middle by the food service area. The underclassmen usually ate in the hall on the right and the upperclassmen in the hall on the left. I'll be honest... the food wasn't fantastic, and I survived to a certain extent on cereal and pasta. I remember that as underclassmen we were required to check in at breakfast in order to promote discipline about waking up on time and getting going. Other than that, seating and hours were quite flexible. Also, as a boarding student, I had "family style" dinner twice a week in the fall and spring terms. I think the philosophy behind family style dinner -- dressing up nicely, sitting with faculty and dormmates, bringing a slightly more civilized aspect to the evening meal -- is right on. I think the execution could improve, however. Specifically, I wish family style dinner weren't so rushed (I had very little time to shower and change between sports practice and dinner), and that the quality of the food were better than during regular meals. The best thing about Windsor was its walking distance proximity to the campus. While the town center had basic services (a grocery store, a CVS, a couple of banks, several small restaurants), a larger trip was required to see a movie, go to the mall, or go to a museum or concert. On another note, there is a small, international airport in Windsor, which was a big benefit for my friends who lived far away. My favorite thing about social life was living in the dorms. I got to be with my friends all the time! Furthermore, the dorm faculty did a good job of arranging stuff for us to do -- movie nights, pancake breakfasts, dorm parties, etc. Word on the street is that my first dorm even has its own Dance, Dance Revolution set up now.